South Tyrol’s many and special excursion destinations wait to be discovered by you. Juval Castles is a medieval fortress and is located on a hill at the entrance to the Val Senales. The fortress is situated in 1.000 m above sea level above Naturns. Juval Castle was first mentioned in a document in 1278. Having changed hands several times and after its first renovation in 1913, it has been owned by Reinhold Messner since 1983. The extreme mountaineer and adventurer had the entire castle complex renovated yet again and spends the summer with his family there. Juval Castle is always worth a visit and visitors never leave without some really strong impressions. The courtyards with Himalaya cedar trees and a dozen rooms are open to visitors. The “Cave of Enlightenment“ or the ”House of Trolls and Gnomes“ are beneath the castle. The world’s most extensive collection of Tibetica, a mountain picture gallery across several floors and Reinhold Messner’s collection of masks from five continents are also accommodated at the castle. A few insights into the private living quarters and the expedition cellar with original equipment for extreme tours are also granted. There are no parking spaces at Juval Castle. Visitors can use the shuttle bus or arrive by foot. The castle can be accessed via various hiking trails (Stabner Waalweg, Tscharser Waalweg, Schnalser Waalweg), walking time: approx. 1 hour. 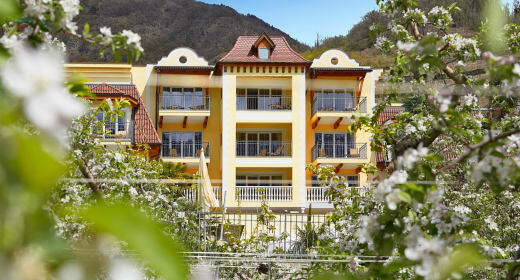 The Merano Thermal Spa opened in December 2005. The linear building of glass and steel accommodates an extensive competence centre for health and wellbeing. The modern thermal spa with its stylish interior design by star architect Matteo Thun is open 365 days a year. The thermal spa opens daily from 9.00 am until 10.00 pm and boasts 25 indoor and outdoor pools, 8 saunas and steam baths, a 52.000 m2 thermal spring park, an innovative spa & vitality area, a medical spa, a modern equipped fitness centre and a cosy bistro. Visitors can also enjoy a hairdresser’s and a shop. Children are well looked after at the free of charge day nursery. The water contains radon and is used in various therapies. The steam of the water has a soothing effect on the mucous membranes, clears the respiratory passages and is therefore ideal for healing complaints of the lungs and bronchi. A brine- and sulphur-containing spring has been rediscovered and its warm waters of 33° Celsius are pure bliss especially in winter. The 50.000 m2 area of the park provides plenty of space for relaxation. Kaltern is situated in 216 m above sea level, around 14 km south of Bolzano, 4 km south of Kaltern and 4 km north of Tramin. The lake evolved from an old river bed of the River Adige and is 1.8 km long, 0.9 km wide and measures 5.6 m at its deepest point. With a surface area of 1.47 square kilometres is Lake Kaltern one of South Tyrol’s largest lakes. The main characteristic of the lake is the pleasant temperature of its waters. Due to its low depth of an average 4 metres, the lake’s waters reach temperatures of 17° to 19° Celsius in spring already. At the height of summer, the temperature rises to 28 °C thus making Lake Kaltern (together with Lake Klopein) the warmest swimming lake in the Alps. The swimming season starts in May and lasts until September. Apart from swimming and aqua fun, trips in rowing boats as well as sailing and windsurfing are also popular activities. Motorboats are not permitted. A signposted and easily accessible hiking trail leads around the lake. Lake Kaltern encompasses the largest remaining wetland area between the Po Valley and the main ridge of the Alps. Here you experience a picture-postcard natural paradise! Hiking tours to Leuchtenburg Castle, the Rosszähnen or a circular tour around the lake are an adventure for all ages! The Dolomites present themselves as bizarre rock formations. The abrupt change from rough rocks to gentle alpine pastures is characteristic for the world-famous mountain range in the southern Limestone Alps, which formed more than 200 million years ago. The Dolomites stretch across five Italian provinces (South Tyrol, Trentino, Belluno, Udine and Pordenone). The “monti pallidi” – pale mountains as the Dolomites are called because of the colour of their rocks – glisten in a red light at sunset, making the appearance of the mountains almost surreal. The Dolomites were declared an official UNESCO World Heritage Natural Site in 2009 because of their unique beauty and geology. For mountaineers, hikers and winter sports enthusiasts are the Dolomites ideal. Ten different Dolomites high routes cross through the mountain range. The “Tre Cime di Lavaredo” are some of the most famous mountain peaks in the Dolomites but are not the only attraction or alpine challenge. With 3342 m is the Marmolata the highest mountain in the Dolomites. Other famous peaks or massifs are the Sella, the Rosengarten, the Schlern Massif, the Geisler Mountains, the Latemar Mountains, the Puez Mountains and the Langkofel. The South Tyrolean Archaeology Museum in Bolzano is the exhibition site of the “Man from the Tisen Pass“, better known as ”Ötzi”. The museum is one of the leading archaeology museums in Italy. The discovery of “Ötzi” is still deemed a sensation. The Ötztal Valley Glacier released the man in 1991 after 5.300 years. The examination of the find took 7 years and “Ötzi” was only brought to the South Tyrolean Archaeology Museum in Bolzano in 1998. Besides the glacier mummy “Ötzi“ and the found pieces discovered alongside the mummy, the museum also exhibits significant finds from the South Tyrolean area. The oldest exhibits are from the Palaeolithic Age and the youngest from the Carolingian period.